There was a time when we didn’t have kids, a time when we never bothered with Christmas lights, decor, trees and so forth. But when you have children and your entire street lights up like noone’s business, then you end up wanting to join the town light parade to some degree so that you’re “imbibing the Christmas spirit” and spreading holiday cheer. But even as your neighbors raise their bubbly Claus inflatables and sic their snowflake spotlights on the neighborhood, you may want to find balance between wanting to impress the town, and conserving energy and money. If you’re a feed subscriber, check this out for the light show. And I think to myself: it’s really cool, but something we’ll never be able to attempt for obvious reasons. Who has the time, inclination, money and energy to do this? And yet, it happens. So I can only be impressed when someone else pulls it off. #1 Opt not to decorate (or even celebrate). I was firmly in this camp when I had no children. When you’re not in your “nesting phase”, doing holiday trims don’t seem like the top thing in your mind when parties and all night frolicking are beckoning you. During that time of my life, my holidays consisted of simple gift exchanges with my childless family members. A decade or so later, things are different and our families are celebrating the holidays more colorfully. The point here is, you don’t have to decorate if you don’t see a need. Or you can do so minimally. #2 Attend someone else’s parties, watch other people’s displays. It follows that if you’re not decorating on your own and not hosting parties, then you’re spending less — a good thing! If you still want to celebrate, be a guest. Attend office parties! Though it’s now a far cry from the dot-com era when the parties were out of this world and FREE (think: corporate excess). These days, corporate parties may no longer be free (we’re charged $25 a head to attend mine), so I skip those that charge and attend those that don’t, such as my spouse’s. One other thing we do is we drive around neighborhoods around where we live that are known to put up extensive and grand light displays. There are streets around that are famous for their Christmas set up. I can just imagine what it’s like to buy a house on such a street — the pressure to participate must be enormous! #3 Prepare and lay out your decorations yourself. You don’t have to buy the decor — they can become fun craft projects if you’re handy. In our case, it’s customary for our family to go out, fetch a tree from a tree farm, put up lights in the yard and ornaments on the tree. If everyone in the family participates, it can be quite an enjoyable time. #4 Use the most energy efficient materials. They save more power to the tune of 3.33% less (according to Gizmodo) than incandescents. They use 10 times less energy than other lights. They are more durable, reliable and last much longer than older lights. They last 20 times longer than mini-lights. They are cooler, so they lower the risk of fires (Christmas tree fires occur more commonly than you think). Replacing large bulbs with LED lights will save the amount of electricity required to power 200,000 homes for one year. To find out how much you’re spending on your decor, you can try this calculator, or this one. 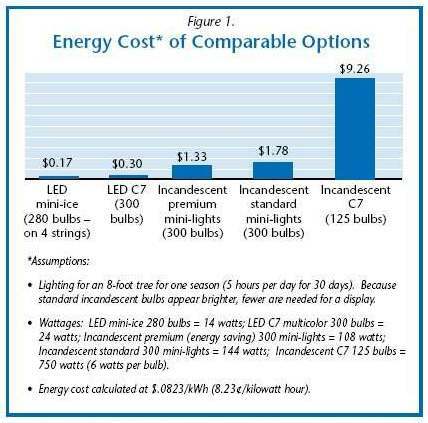 The downside here is that LEDs cost more money initially while you save on the energy use; the cost is typically twice that of mini-lights. But for the goal of energy conservation to “save the planet”, buying LEDs would be worth the investment, even if it means that you break even after 13 years. So I already mentioned you can do things more minimally. If you’d like a tree, instead of that 8 ft ceiling scraper, go for the 5 ft one. Or the kind you can put up on a table somewhere (those are pretty cute). Instead of a dazzling light circus on your yard, go with less lighting. I guess the idea is to moderate oneself and not be tempted to outdo the guy next door. Make sure all lights you purchase contain the Underwriters Laboratories (UL) label, which means they meet UL safety requirements. While you’re reading labels, be sure you’re buying the right set–for indoor use, outdoor use, or both. Before installation, check for frayed wires, damaged sockets, or cracked insulation. If you find any defects, replace the entire set. All outdoor cords, plugs and sockets must be weatherproof. Keep electrical connections off the ground. Remember that hot bulbs can ignite dry tree branches. To avoid disaster, keep trees well watered and keep extension cords and light strings away from the water. Light your tree only when you are at home and awake to enjoy it. Keep a fire extinguisher handy, and be sure your home’s smoke detectors have new batteries and that they’re working properly. Turn Christmas lights off during the day or when you are away or when you are asleep. Timers are a simple way to do this. Always unplug your lights before going to bed or leaving home. Protect little fingers: Make sure there’s a bulb in each socket. If a bulb is burned out, leave it in until you have a replacement. To prevent electrical shock, never use electric decorations on artificial trees with metallic needles, leaves, or branches. Make sure artificial trees are flame retardant. Take the lights down after the holidays! No need to light up the night until spring! Yes, holidays have a cost — the decor is pricey, gifts entail a bite out of your budget, and these next two months will make you shake your head after you see your bills. But it’s fun. And tradition. And when you have kids, it becomes a bigger deal. I always find it a great accomplishment if I can manage to save money and/or energy during this time of year since whatever we do save, we use to beef up our charitable giving efforts for the year. Somehow, it works out pretty well in the end. Great post, thank you. That video is amazing. I grew up in a northwest Houston suburb where I had friends in a neighborhood that required signing a contract of participation when you bought a house there. Every street in the entire subdivision has its own theme, and every house in the subdivision has to participate. We’re not planning to decorate for Christmas because we’re not terribly festive people. We’ll be spending the holidays with our families and plan to help them decorate. Plus we’ll go on walks through the neighborhood next to us and look at all the decorations (we did the same with Halloween). This will probably change when we have kids, but for now we’re going low-key. I must say, I really enjoy the lights, but I’m glad I’m not paying for the electricity there. We go with energy efficient material. It is just too much fun to celebrate Xmas when you have kids! Thanks for putting the video of my house on your website! OK… That isn’t my house. But it is very cool. I have a friend who works in the lighting industry and he designs things like this for corporate events and concerts. It’s a lot of work! LMAO @ Analisa – that would have scared me off buying the house. The thought of having to do that once a year – nightmare. Did you friends move? I’m still in the “no kids” stage and am not participating in the light up my house craze. Not only is the electric bill expensive, but it’s a lot of work just to have to take them back down in a month or so. I’ve also watched a lot of those HGTV shows where it took people several months (starting in the summer season) to prepare their house for the massive Christmas displays they come up with. In our neighborhood, we have a neighbor who has built a train that can seat several people in several cars — this train takes people around their property and is decorated differently each holiday. So for Halloween, the train had the scary motif and their property was covered with ghouls, witches, pumpkins and the like. This time, it’s all about the yuletide season of course! Families line up in front of this guys’ house for the ride around his house. It’s nice to have neighbors who take the time to do this sort of thing for the fun of it — I guess he’s a train hobbyist of some sort. @Bag Lady — I’ll see you there at the San Carlos neighborhood! That was the area I was referring to in my post, actually! We go there every year and are part of the traffic clogging that poor street. It’s a wondrous place though and the lights just dazzle. @Fiscal Musings — Agreed, it’s some work so that’s why I only let people who want to do the decor to do it. Believe it or not, there are people in my household who enjoy putting the lights up. We only have the lights on for a few hours a night so it’s not so bad money-wise. When I was growing up, half our christmas lights would be un-usable from the previous year. It’s pretty much a scam to get you to buy new ones every year, but I’m glad they came out with LED lights to cut down on that scam. The comparison chart is really interesting I never would have expected such a gain in efficiency would be possible however swapping over to LED lighting maybe a step to far? I think using the latest in LED technology around the house can save electricity. I hear the LED Christmas lights use about 70-90% less energy. Thanks for posting up the video. That’s very cool. I really like the idea of installing LED lights rather than those conventional lights in the market. Saving energy is on the top priorities right now as well as saving money. Thanks for the video and also the price comparison. I get the feeling that fewer people are decorating (excessively) which is a good start. The LED technology both in xmas lights and in the house seems to be the right approach. I work in the Electrical distribution industry, and this is good advice. I’d LED lights to anyone, of course, but in some cases you might consider the much maligned low pressure sodium. Though it’s said by many to be outdated, it can be especially useful in that it helps lower light pollution (meaning excess light going everywhere you don’t want it to, such as the sky, your neighbors yard, etc). The only downside is the poor color rendering index, but unless you’re trying to read outside at night, you should be fine. LED lights are more expensive than conventional lights but it is an investment for the future, plus they last much longer. It’s good for our planet and it’s good for our wallet as well !